The Shreiner-Concord Cemetery Foundation has completed the first phase of long-term improvements to this historic site in our community. Your interest and support will be greatly appreciated. Thanks to a grant from the Commonwealth of Pennsylvania, work has been completed on sidewalk and tree planting work along the North Mulberry and West Chestnut Street sides of the cemetery. This $75,000 grant was secured through the efforts of PA State Rep. P. Michael Sturla of Lancaster from the Commonwealth’s Department of Community and Economic Development. Of the total, approximately $50,000 was directed to improvements along the two main public streets abutting the cemetery and $25,000 was used for improvements within the cemetery. This phase of the improvement project was completed in 2009. 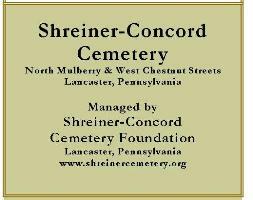 In August, 2009, the Board of Commissioners of Lancaster County awarded the Shreiner-Concord Cemetery a grant of $38,205 under the County’s Urban Enhancement Fund. Combining this grant and the remainder of the state grant, the Foundation Board of Directors contracted the services of a conservator who specializes in repair and restoration of historic masonry. With extensive assistance from community volunteers, the firm – Mosko Cemetery Monument Services of Hanover, York, PA, completed restoration, repair and cleaning a majority of the broken, sunken and vandalized grave stones on the property. This work was completed by Fall of 2011. This project includes two important features to engage the public in the long term care and maintenance of the historic cemetery. 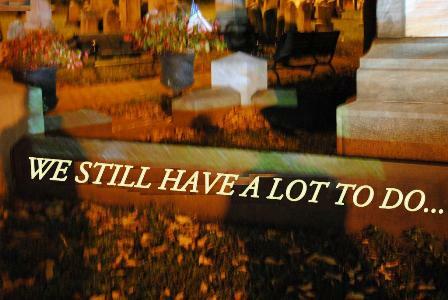 Our grave stone conservator trained area residents in the repair and re-setting of damaged and sunken grave makers. The firm also trained members of the faculty and students from Thaddeus Stevens College of Technology in Lancaster in grave stone repair. The Stevens College representatives repaired three grave sites at the cemetery. Fortunately, there are no issues of deterioration to address at the grave and memorial of the Honorable Thaddeus Stevens (1792-1868), the college’s famous namesake. But the Shreiner-Concord Cemetery Board believes it is no less significant that an instructor and students from the college have contributed their time to our project. Community volunteers and Stevens College staff and faculty continue to assist in maintenance and repair work. An important aspect of the labor contributions by the Stevens College representatives and area residents is that the Lancaster County grant funds were secured in part by using their work time and labor as an in-kind match. 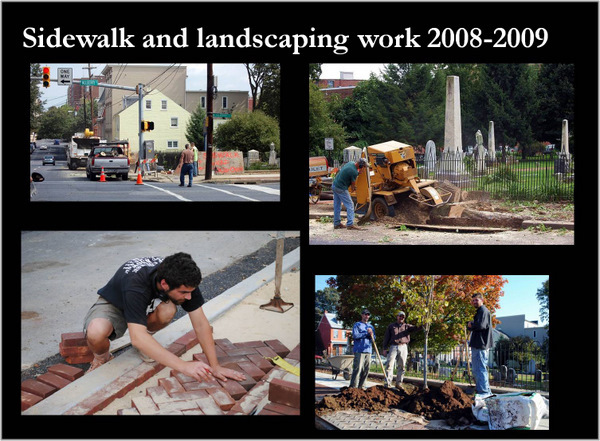 These contributions of nearly 400 hours of labor over the fall of 2009 and the spring of 2010 will enable the Foundation to design and install an informational kiosk in the cemetery. This display, similar to others now installed around the City of Lancaster, will describe the life and legacy of Thaddeus Stevens and the origins of the cemetery in 1836 by clockmaker Martin Shreiner (1976-1856). Stevens, an abolitionist and author of the main civil rights amendments to the U.S. Constitution, chose to be buried at this public cemetery because Shreiner’s operating and burial rules were not restrictive based on race, as were other cemeteries in Lancaster at the time. 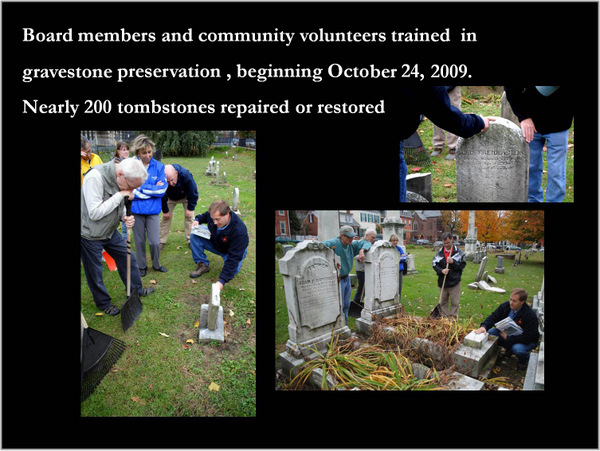 Your time as a volunteer attending training and hands-on gravestone repair/restoration directly assists our fundraising efforts. If you would like to participate in our upcoming preservation training and repair work, or if you would like to be involved with various community events at the Cemetery, please contact Connie Callman, Foundation Board Treasurer, or visit us on Facebook.